Ben Roethlisberger, cheered loudly during his first game in 9 1/2 months, shook off the rust from his four-game suspension to throw three touchdown passes as the Pittsburgh Steelers shut down a depleted Cleveland Browns offense during a 28-10 victory Sunday. With Roethlisberger reveling in the cheers he once feared he might not hear, the Pittsburgh Steelers looked like themselves for the first time all season. They also sounded like the team that loves to intimidate. To the Cleveland Browns, it was Steelers linebacker James Harrison who was the game's impact player. Twice. With the Steelers (4-1) leading 7-3 but backed up to their own 4 late in the third quarter, Roethlisberger - flashing the big-play ability his team lacked without him - completed passes of 50 yards to Mike Wallace and 36 yards to Heath Miller on successive plays. Three plays later, Hines Ward fought through two potential tacklers on an 8-yard touchdown catch that made it 14-3. Roethlisberger also threw scoring passes of 29 yards to Wallace and 14 yards to Miller. He finished 16 of 27 for 257 yards during his first regular-season game since he was accused of, but not charged with, sexually assaulting a Georgia college student in March. Then, numerous Steelers fans professed to be outraged with the quarterback's actions. Except for 20 sign-carrying protesters outside Heinz Field, that anger wasn't evident as Roethlisberger received numerous loud ovations from the standing-room crowd of 65,168. 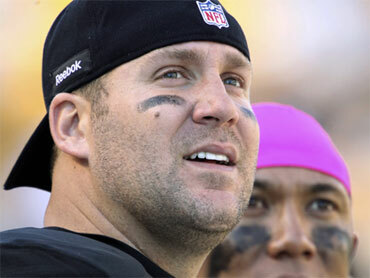 "I started thinking about it on the way here," said Roethlisberger, who once worried that his reception would be chilly. "Before the game I got emotional. To hear the cheers was something special. I got a little emotional." The Browns (1-5) couldn't get into the end zone until rookie Colt McCoy threw a 12-yard scoring pass to Ben Watson with Pittsburgh already up by 18 points. McCoy (23 of 33, 281 yards, five sacks) didn't look overwhelmed in his first NFL start, but he played with a depleted cast after Harrison hits sidelined wide receivers Joshua Cribbs and Mohamed Massaquoi with head injuries during the second quarter. "We had our hands full with those guys," McCoy said. "They're really fast, they're really good." Cribbs left after a helmet-to-helmet caused him to crumple onto the turf for several minutes. Massaquoi was shaken up after Harrison's hit caused him to drop a pass. Alex Mack, angry at how Harrison kept sidelining his teammates, reacted by angrily kicking the ball about 20 yards to the Browns' sideline, drawing a delay-of-game penalty. "You don't want to injure people. I don't want to injure anybody," Harrison said. "But I'm not opposed to hurting anybody." Apparently, his teammates aren't, either. "He's a beast," Ward said of the 2008 Defensive Player of the Year. "When you see him knocking guys out, you know he's a man on a mission. You don't want to see guys get hurt, but he set the tempo for us." With Cribbs unable to operate the wildcat set the Browns used effectively in upsetting the Steelers 13-6 in December, Cleveland's offense took on a more predictable and easier-to-defend look. Cribbs ran for 83 yards in that game; this time, Peyton Hills had a team-high 41 yards. "It makes it tough when you're planning to vary the attack with couple of different things, and we're out of it with quite a bit of the game left," said coach Eric Mangini, who started McCoy because Seneca Wallace and Jake Delhomme have high ankle sprains. The Browns were forced to play the second half with only two healthy wide receivers, Brian Robiskie and Chansi Stuckey. It was another oddity in a game in which none of the four active quarterbacks - Roethlisberger and Byron Leftwich, McCoy and Brett Ratliff - had previously thrown a pass all season. Still, McCoy's encouraging performance against a defense that has allowed a league-low 60 points offered some hope. "He had a lot of poise for his first game, playing against one of the toughest defenses in the league," Mangini said. The Steelers, beating Cleveland for the 13th time in 14 games, moved into first place in the AFC North as Baltimore (4-2) lost to New England 23-20 in overtime. Roethlisberger didn't get off to a great start; he was intercepted on Pittsburgh's first drive, but came back to find Wallace for the game's only touchdown in the first 41-plus minutes. "We didn't want him to be flawless," said Wallace, who welcomed Roethlisberger back by cutting the Mohawk haircut the quarterback disliked. "Then we wouldn't have anything to work on in practice." To ease Roethlisberger in, the Steelers ran Rashard Mendenhall frequently at the start. He finished with 84 yards, including a 2-yard TD run. Cleveland's most effective play was a punt inside the Steelers 10; Reggie Hodges did that four times, repeatedly backing the Steelers up and keeping the game close - at least until Roethlisberger got away from a predictably conservative game plan to hit the long passes to Wallace and Miller.